Gigi is turning 8 years old! She’s stuck at home alone today, while Kristin and Krister are at work and Kasen is in school, so we celebrated yesterday. Kristin: Gigi only plays with the toys on the top of the basket. 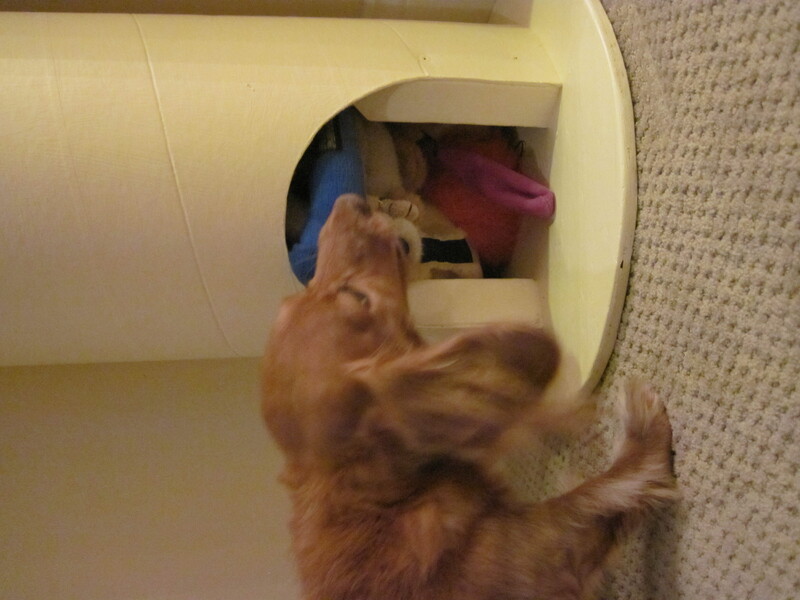 Krister: But she likes the toys on the bottom too, she just never sees them. 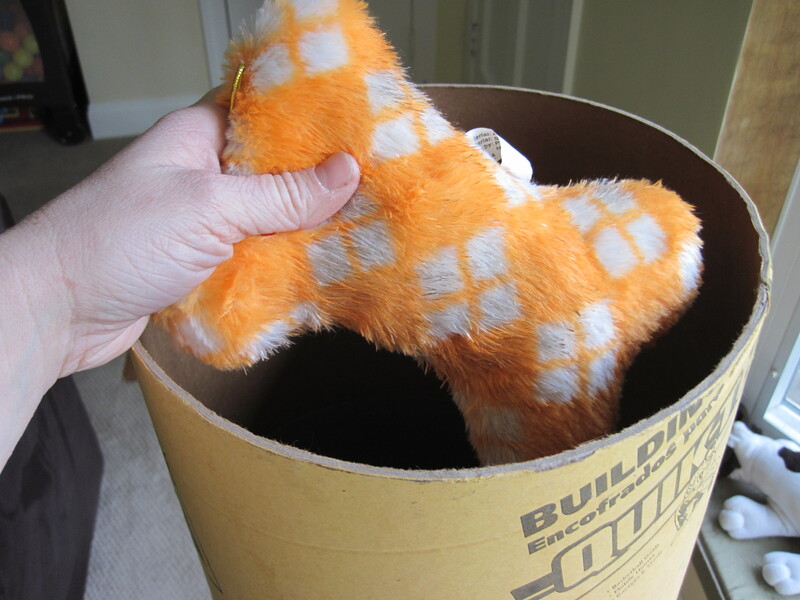 Kristin: Someone should make toy storage where you put toys in the top of the container, but the dog pulls the toys out from the bottom. The tube was the perfect diameter to fit Gigi’s toys. The first step (after buying the tube) was to cut a little mouse hole in the bottom of the tube, where Gigi could pull her toys out. 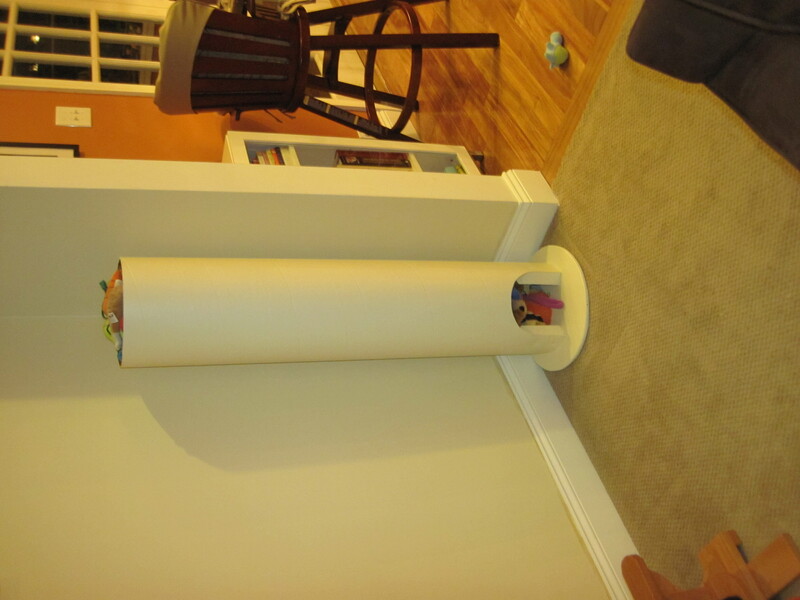 Next, we had to weight the bottom so that, when Gigi pulls her toys out, she doesn’t knock the whole tube down on top of herself. 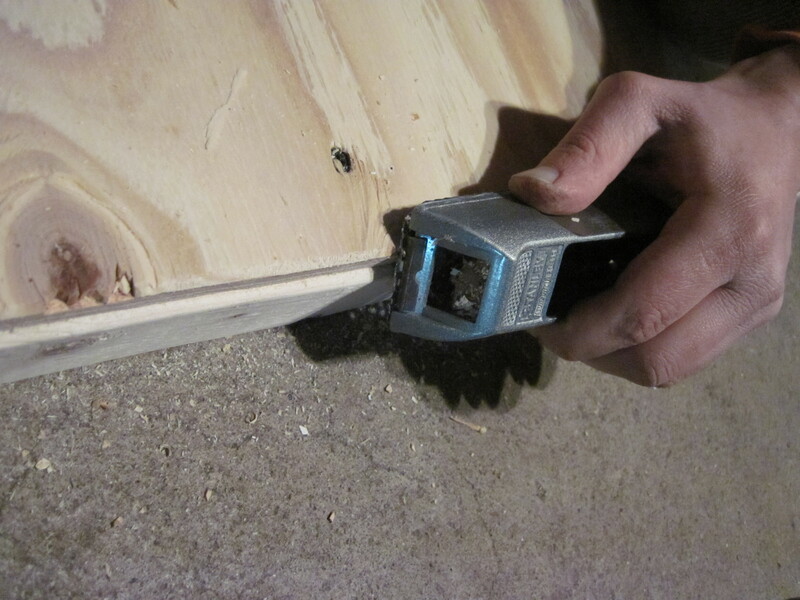 We cut some 2x3s that we had left over from our headboard project. We cut them slanted at the top because they would be inside the tube, and we didn’t want the toys to get stuck on them when they were getting pulled out of the tube. We intentionally screwed the 2x3s right next to the mousehole. We did that to support the edges of the tube when Gigi was pulling on the tube. The tube is just made out of cardboard, so if she pulled too hard, it could rip. The wood reinforced the sides of the mousehole to prevent it from wearing quickly. 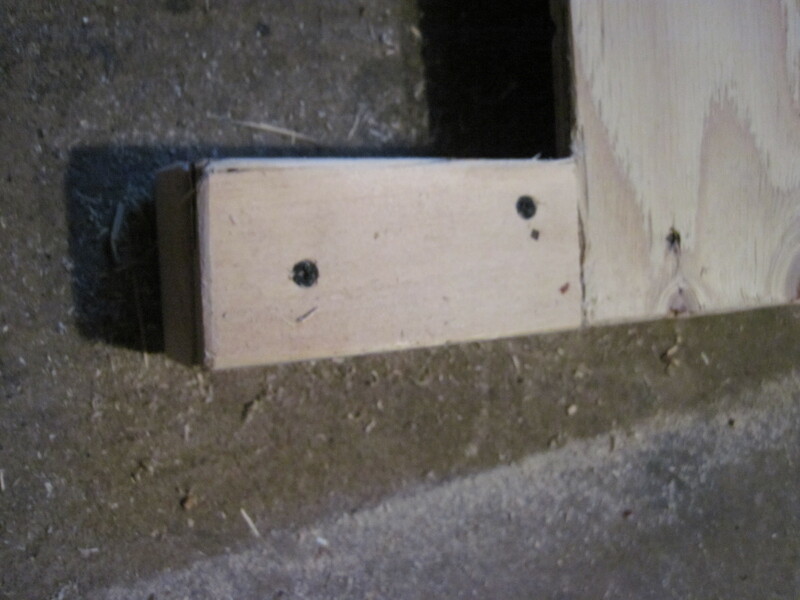 Then we cut some plywood, also leftover from our headboard project, and screwed it into the footers. 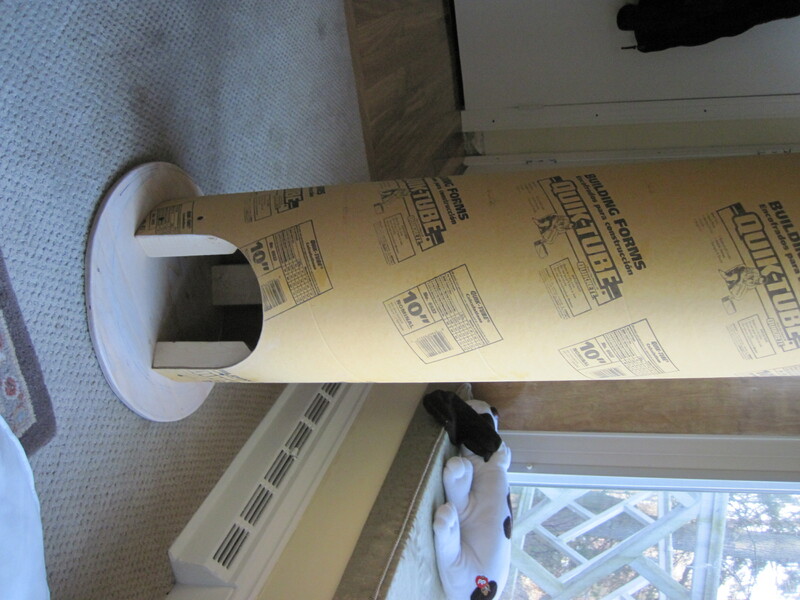 The plywood is in a circle, but it is not centered on the tube. 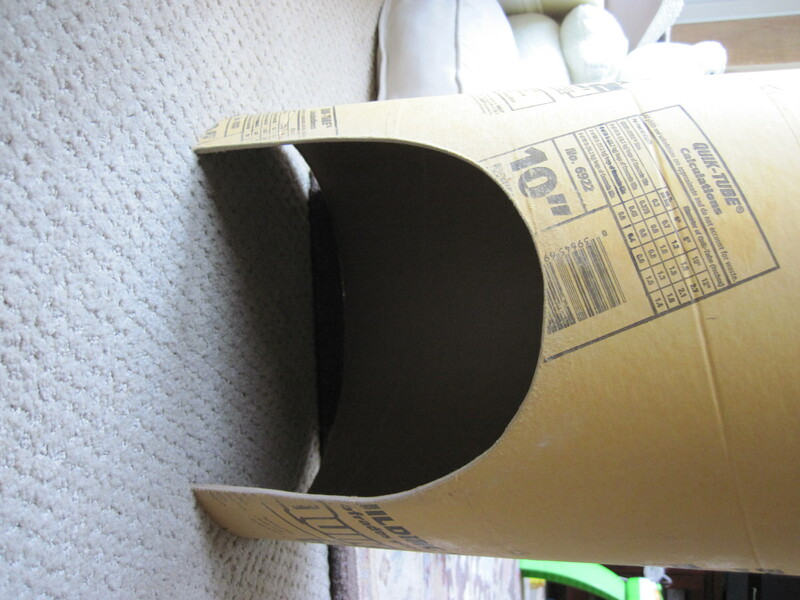 The tube is set slightly to the back, because when Gigi pulls on her toys, it would tend to tilt toward her, so we wanted extra wood near the opening to counterbalance. We attached the base to the 2x3s with glue and screws, to make sure it was very well attached. Then we painted it to match the walls (to help it blend in as much as possible). We’ve talked about covering it with fabric, but we haven’t done that yet. We might put fabric over it at some point, but we’re digging the paint as a we-have-that-in-the-house solution. Gigi loves it! 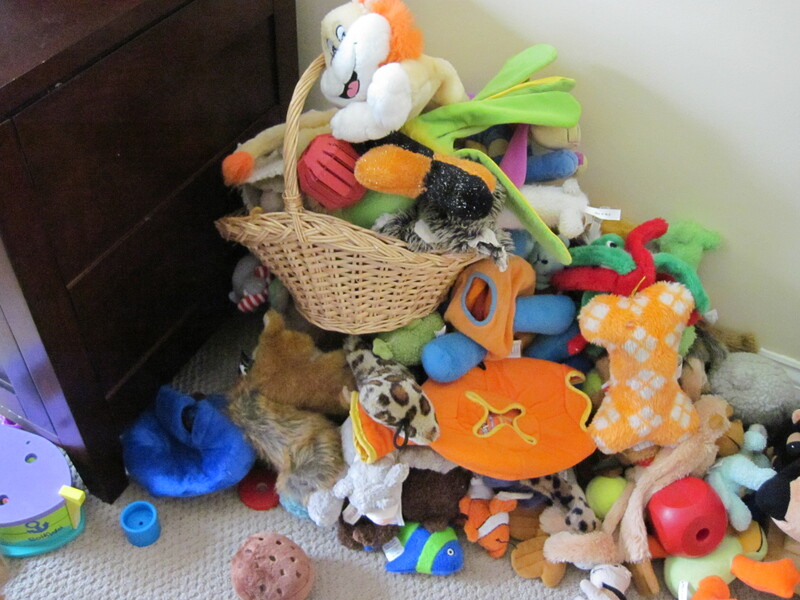 Of course, we know that most puppies do not have as many toys as Gigi. 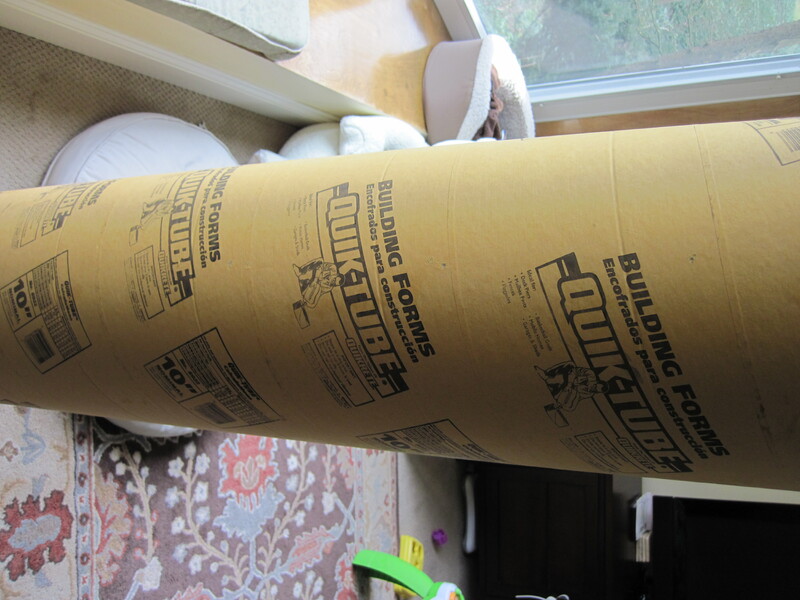 The great thing about this tube is that it’s just made out of cardboard – you can cut it to any height you’d like. 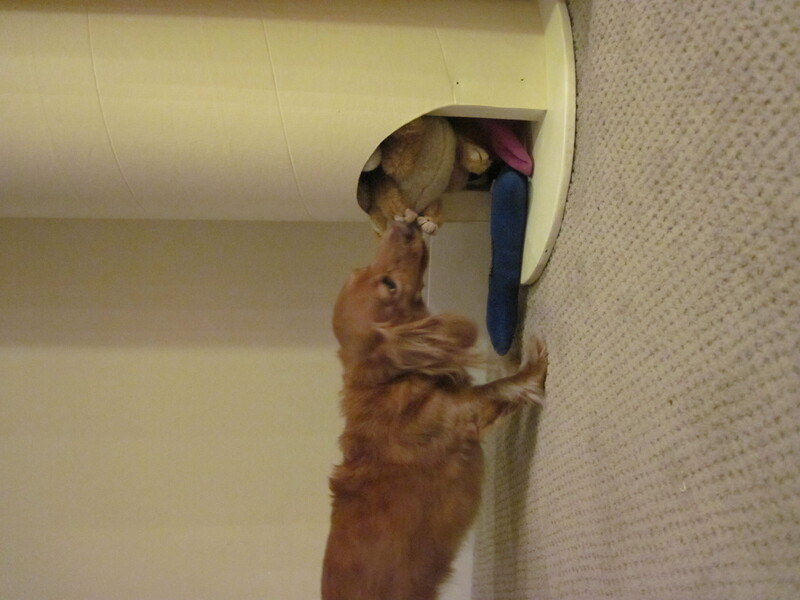 If your dog has half as many toys as Gigi, then your tube could be half the height. 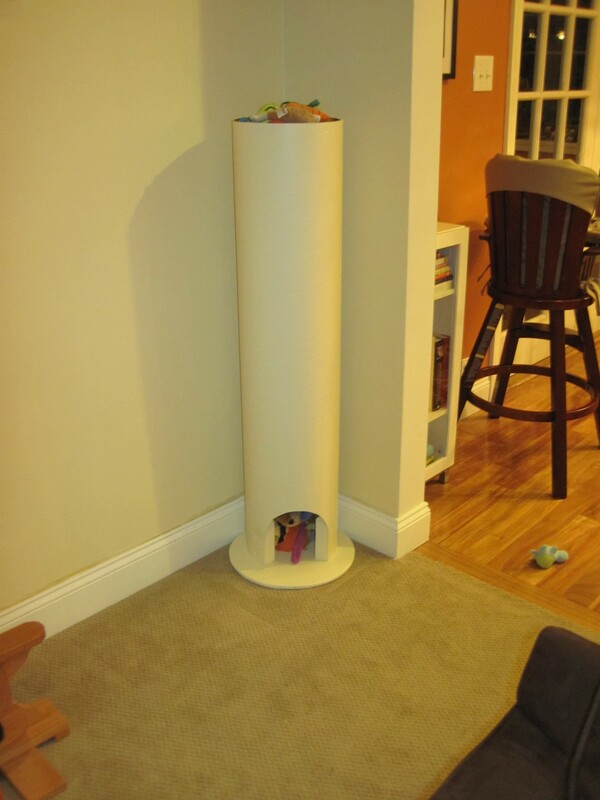 That said, we did not expect Gigi’s toys to fill the tube to the brim, so we recommend putting the toys in the tube before you trim it down to see how much space you need. P.S. For the full details on how we celebrated Gigi’s birthday, check out our Family Blog. We love everything about it – its proximity to parks and shopping and our jobs, our wonderful neighbors, the gardens…. you name it. Did we mention the pretty gardens? Although sometimes it feels like we’re always under construction, would you believe the projects we’ve completed since moving in? We kicked off our home improvement blitz with the baby’s room: after months of trying to remove wallpaper, we finally gave him new walls, moldings, and carpet. We painted, brought in new furniture, and remodelled the closet just in time for his arrival. And a mere year and a half later, we finally gave him his built-in cabinets for his toys. We overhauled the master bedroom, including a new ceiling (bye-bye popcorn! ), crown moldings, a homemade headboard, flowing curtains, and some fun decorative details. The garage went from old school to super modern after we ripped out all the old shelving, painted the concrete walls, and applied epoxy flooring. We updated the kitchen and living room with fresh paint and crown moldings. We brightened the space up with recessed lighting in the living room and cozied our dining area with a chandelier that casts beautiful shadows on our ceiling. We also pulled the valence off of our picture window in the front, which brought in more beautiful sunlight (and an even better view of the front yard). 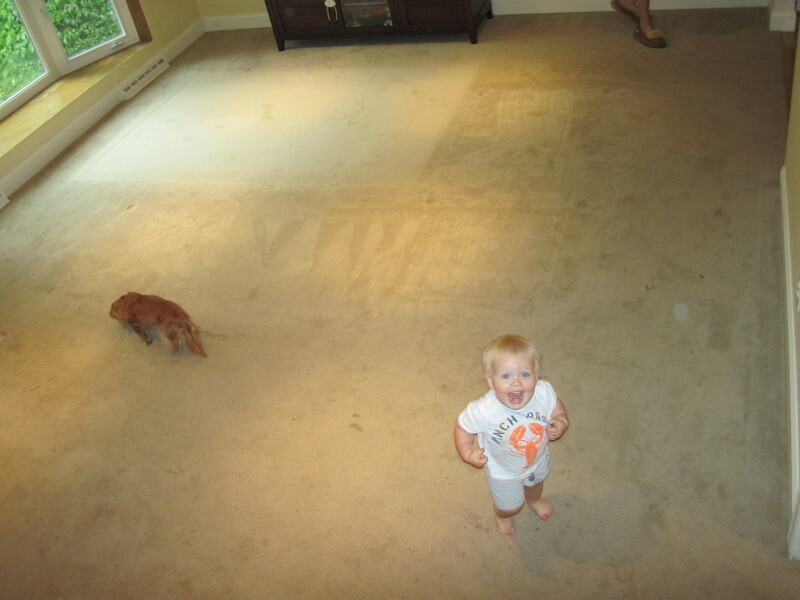 We remediated the leak in the sunroom and added new furniture and a patio door, for easy access to the backyard. And we don’t want to forget everyone’s favorite project: Our Someday Patio! We dug out all the dirt and have a partially assembled wall. Progress indeed! We can’t help but reminisce about all the great memories we’ve made in the house. 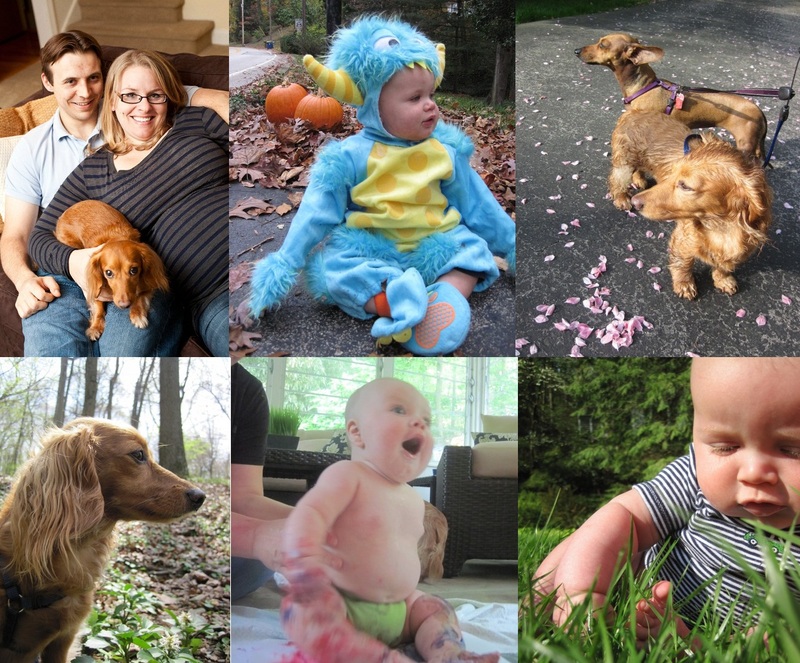 We’ve hosted countless holiday celebrations and parties here- our baby shower, Kasen’s first birthday party, and Kristin’s annual “Mimosas and Coffeecake” party, to name a few. We brought Kasen home from the hospital to this house and caught Gigi stealing food from him almost everyday since then. You must expect that we’re far from done, of course! We haven’t even touched the laundry room, any of the three bathrooms, the exercise room, the laundry room, the guest room, or the basement. And the rooms we have been working on are far from finished! We’ve got big plans for them over the next year and you know we’ll keep you posted. We can’t wait to see what the next year brings us, but we’re sure that nothing will be the same on our next home-ownership anniversary in 2013. Even though we don’t like Ikea furniture, we do like their low-cost accessories. We’re talking picture frames, planters, kitchen supplies. So, on our second-ever trip to Ikea, we made our first-ever Ikea purchase. Okay, purchaseS. We bought a pitcher and some kid-friendly plates and…..
It’s a small change in a room that needs a lot of attention (side table, lamp, bureau, mirror), but it makes us happy. Anyone else make any small improvements that left you with a big smile? 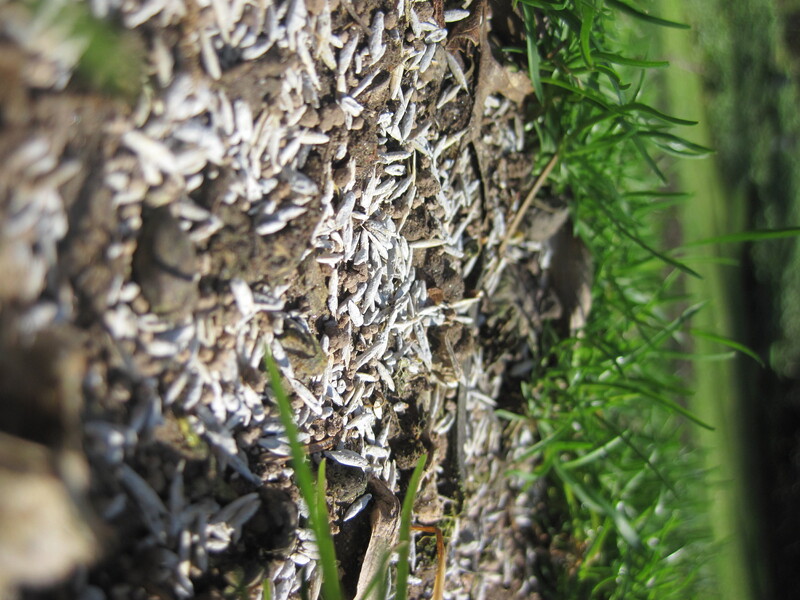 With the beautiful weather we had last weekend, we got a head start on our lawn. Believe it or not, this is what we get excited about when it’s warm outside. We also put down some lime. 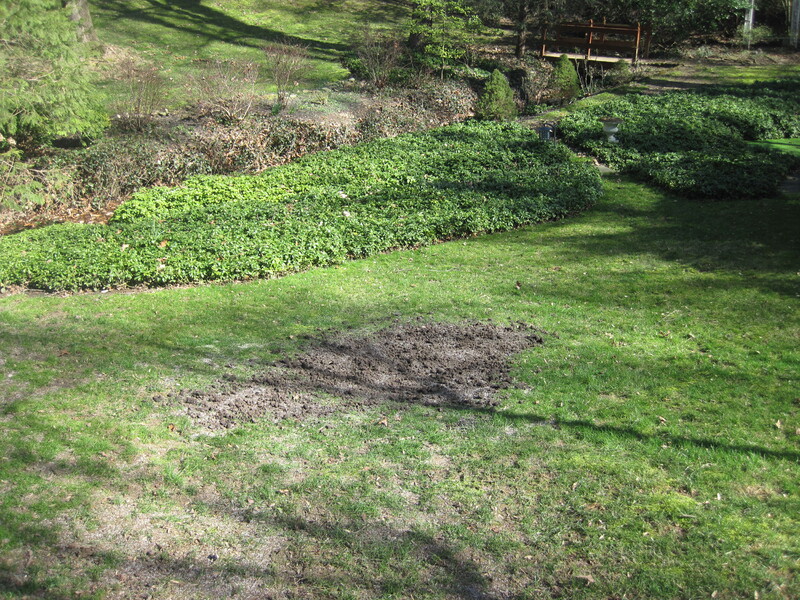 Our hope is that the lime will counteract the decomposing leaves (and dog pee) on the lawn. Just as fair warning to all of you taking care of your lawns – the lime will get caught in little dog paws and make a mess in the house. 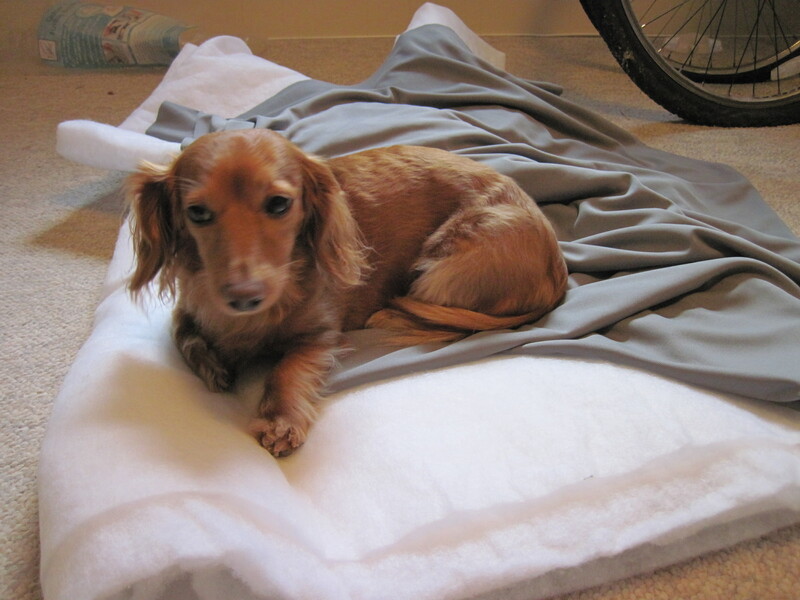 We have been taking little Gigi all the way out to the far stretches of our lawn so that we could avoid that issue. We finally got some rain though, so maybe that will help. 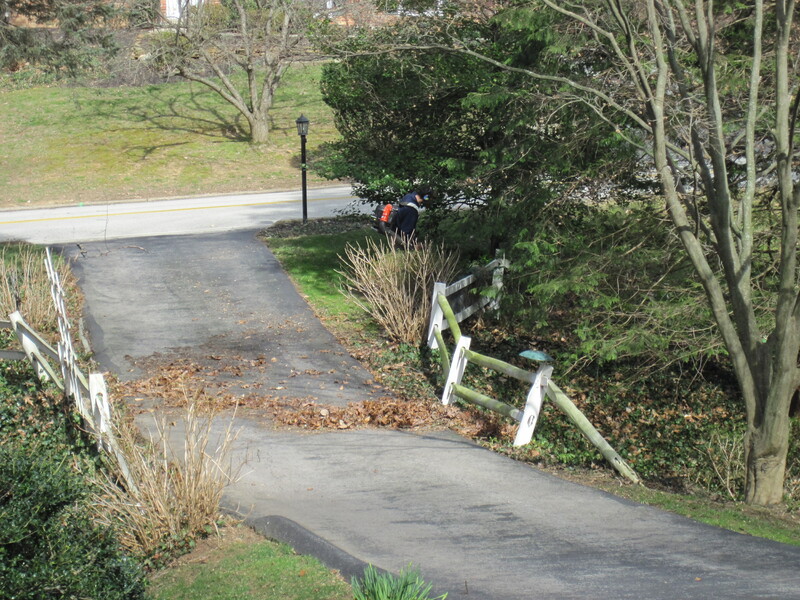 We are pumped that we got this yard work started early this year. Last year, we were so busy with the baby that we did not have a chance to start on the lawn until late in the season. The year before, we moved into the house mid-summer, so we had no chance to work on the lawn. We hope that the jump start will make a difference come later in the summer! This was a great cleanup (do we say that about all of them??). We go into this closet on a daily basis for one thing or another and it was getting so packed with stuff that we couldn’t get in there if we needed something. Now there is space to move around easily. Plus, there is shelf space if we need to move something down there. It’s great. So open and airy and spacious. You’ll also see that we added a bunch of basket organization in the back. We grabbed those baskets from around the house. We even used some of Gigi’s former toy baskets to help keep things organized. 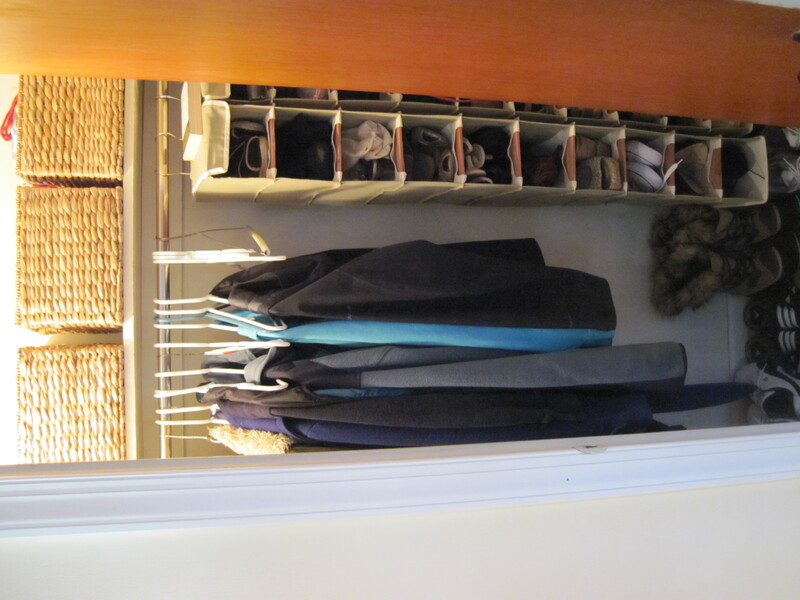 We did that in several spaces (our favorite new baskets are in the coat closet). The baskets make things look and feel a lot more organized, without actually having to keep them that way. It’s so easy to just throw things into the baskets and conceal the mess. So that’s it! We got so much stuff out of our house… we’ll be give you a recap tomorrow, including some pictures of mound of stuff we got out of our house. Let’s just say, you’ll be impressed. Well, maybe, if that kind of thing impresses you. And if you’re easily impressed. We wanted to pick an inspiration that looked relatively simple to recreate (i.e. didn’t have a lot of curves or structural details that were going to complicate things). We wanted something simple. There are LOADS of DIY headboard posts out there. 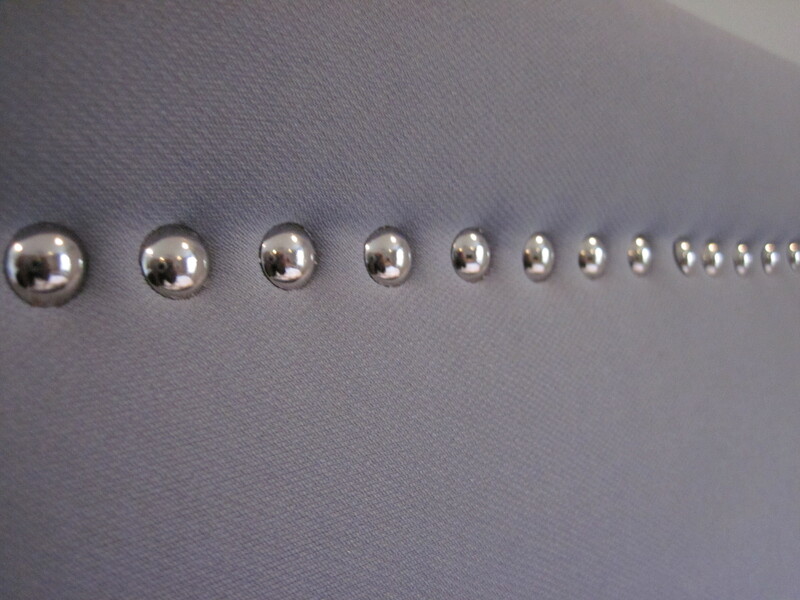 We love the look of a nailhead-trimmed detail (thus our inspiration), which lead us to some extremely helpful posts. We settled on using Centsational Girl’s post, since the inspiration was exactly the same as ours. You can find the original tutorial here. Immediately, we knew we were going to tweak the tutorial a bit. The tutorial calls for a headboard that is hung on the wall, but we wanted one that stood on its own two legs. 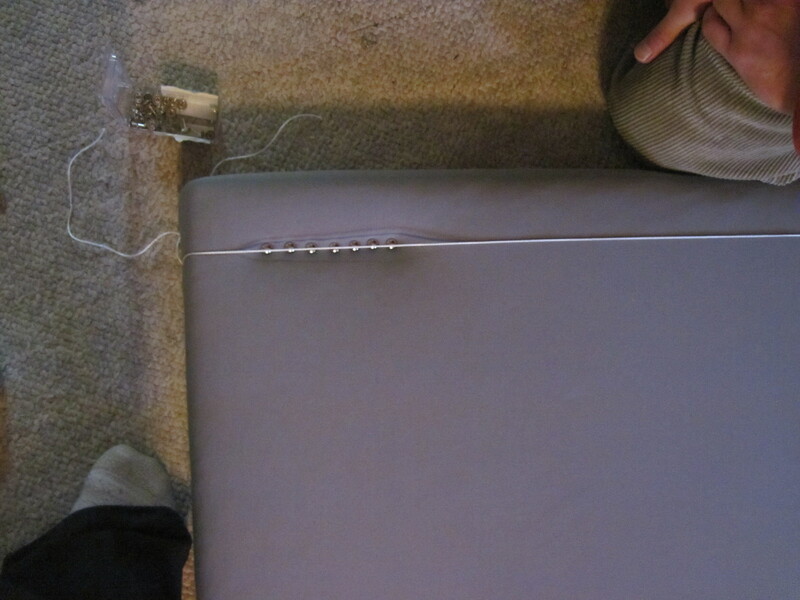 We also made another change (spoiler: we didn’t use a nailhead trim kit), which we’ll talk about in more detail later. We totally cheated on this one. We just went to a few websites to see what a standard sized headboard was and copied them. The standard queen-sized headboard was 64.5 inches wide. It looked like we had more flexibility on height, but we settled on 53.5 inches tall. We liked the headboards we saw in that height, plus it seemed pretty reasonable in our room. (The quilt, by the way, looks even more amazing in person – the ruffles are a little subtler and it has a nice smokey grey fabric underneath.) Kristin thought the best way to find a complementary grey would be to stick with the same company, especially since we could use the same type of fabric as the nearby curtain panels which we also picked up from West Elm. Unfortunately, when we went to go pick out a curtain panel, we discovered that the panels are all 48″ wide. 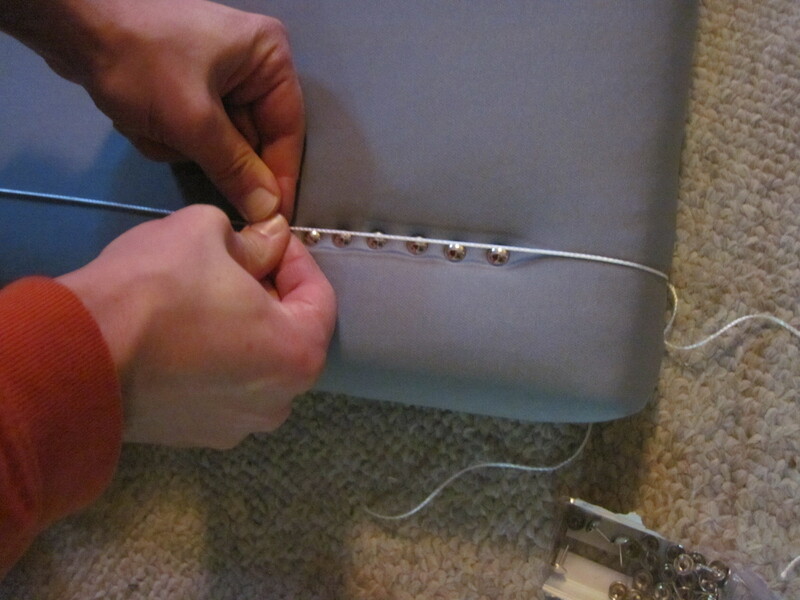 If we got a 48″ wide panel, we would have to sew a couple pieces together, and, frankly, Kristin has no idea how to sew them together without having an obvious seam. 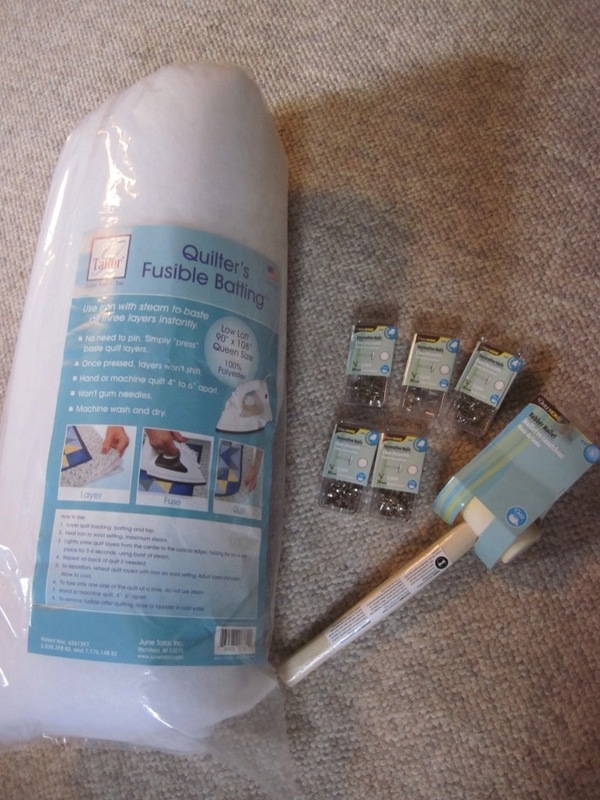 So, we scrapped that idea and headed for Joann Fabrics. 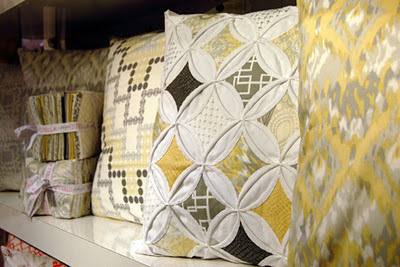 We grabbed our new yellow-and-grey pillow to help us find the right shade of grey. The pillow has so many perfect shades of grey in it. It has dark grey and light grey (like the pillows we got for Christmas), very dark grey (like our new duvet cover), and a medium grey. 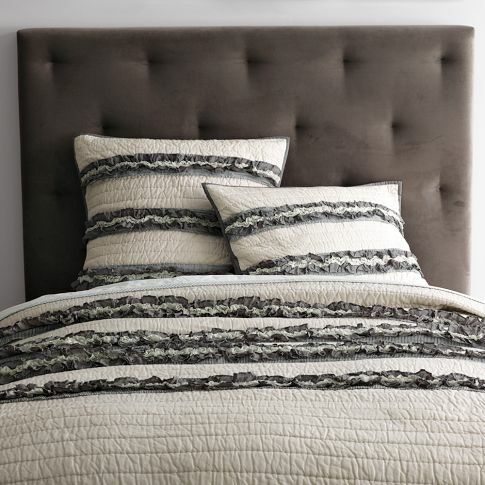 We thought finding a matching medium grey would balance the bed out perfectly. Imagine us carrying the yellow-and-grey pillow like a baby throughout the Joann Fabrics store, only taking it out of our tight grasp to compare it to every grey fabric in the store. The only trick was finding a good fabric in an extra-wide size. 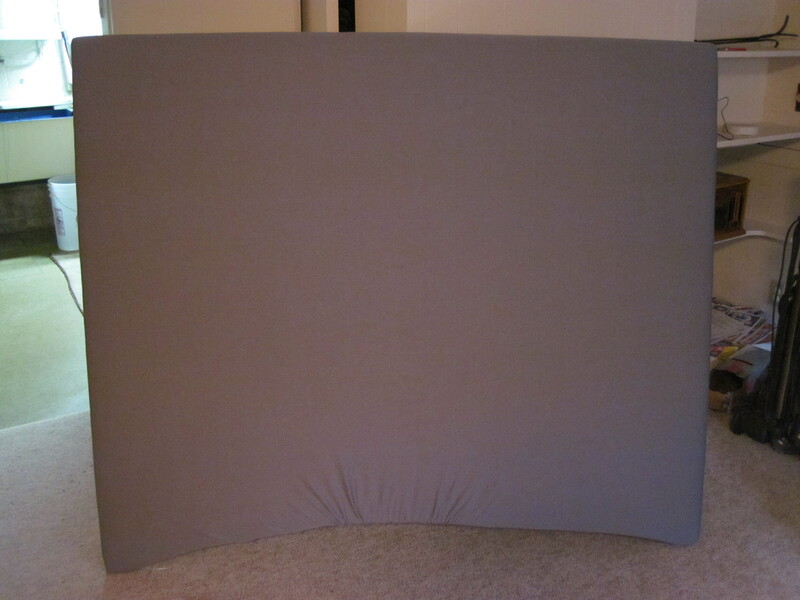 We were hoping for a 60″ wide panel because a 60″ panel would be wide enough to cover the 53.5″ height without a seam. Gigi approves. It’s a soft, jersey fabric. We loved that it was soft (after all, we will be sleeping with our heads against it) and the perfect color, but we were nervous that it was too stretchy. 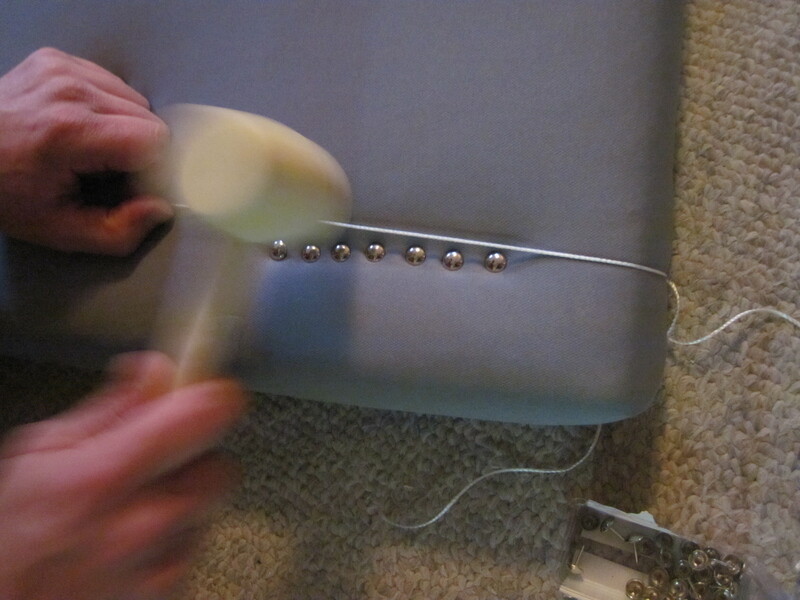 We weren’t sure whether the fabric was going to rip when we attempted to attach it to the headboard, especially since we had read that it would need to be pulled pretty tightly. (good news: it held up!) We ended up buying a couple of pieces of fabric – one piece that was 2.5 yards and a second piece that was 1.5 yards, just in case we needed some more. 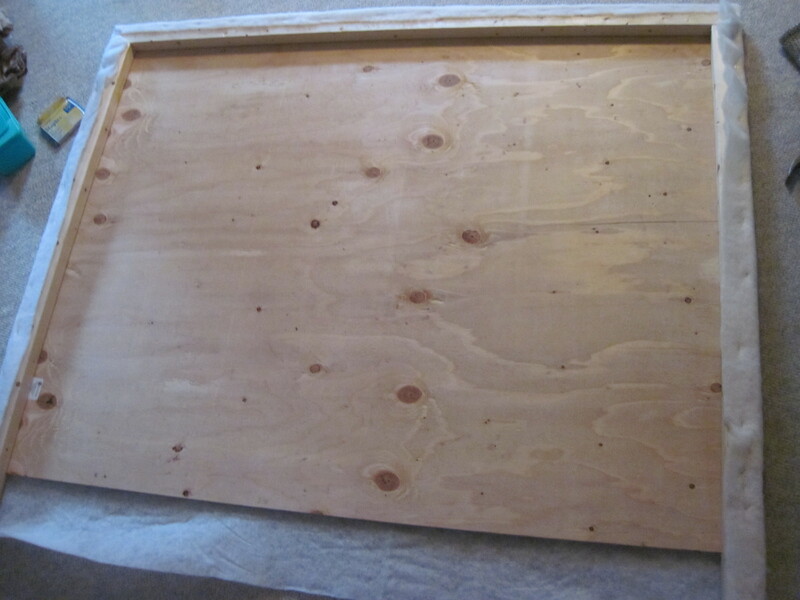 Next, we built the frame for the headboard. 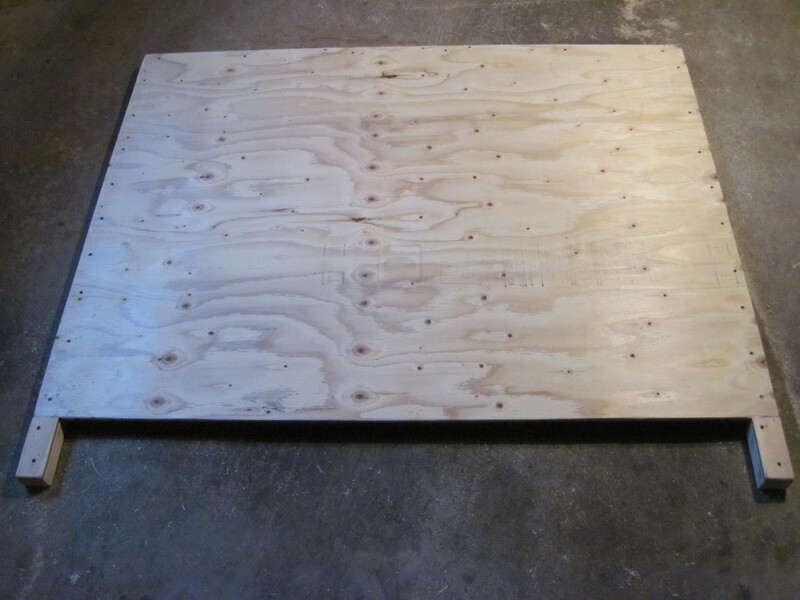 We took the plywood and trimmed it down to 64.5 inches wide (leaving it 4 feet tall). 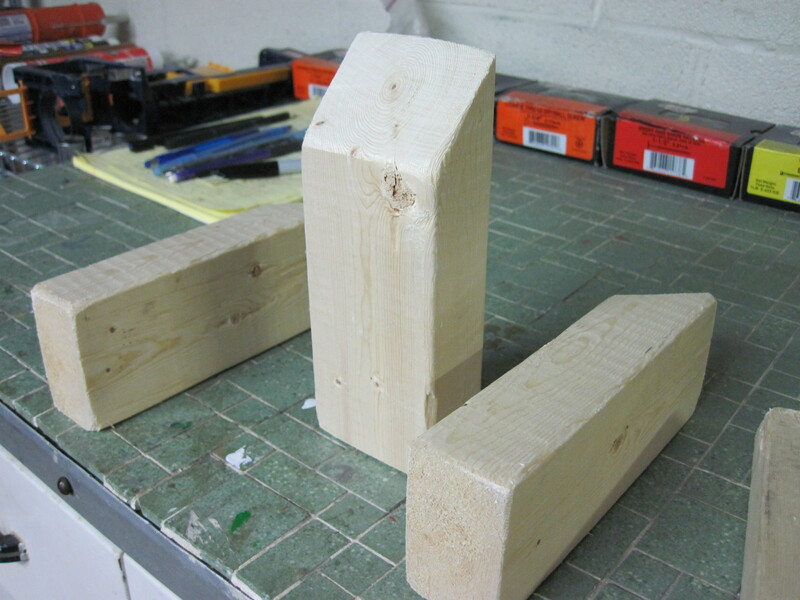 Then we cut the three pieces of pine: 2 pieces that were 53.5 inches and one that was 58.5 (64.5 inches wide minus 3 inches for the left and 3 in for the right side of 2×3 pine). We screwed the planks of pine into the plywood to complete the main shape of the frame. 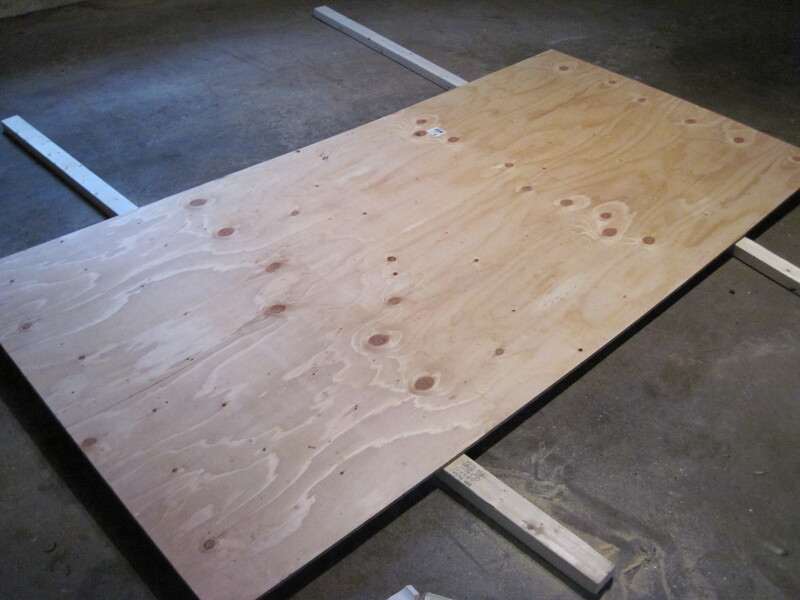 Lastly, we also sanded the edges of the plywood so that it wouldn’t rip the fabric or poke us at night time. 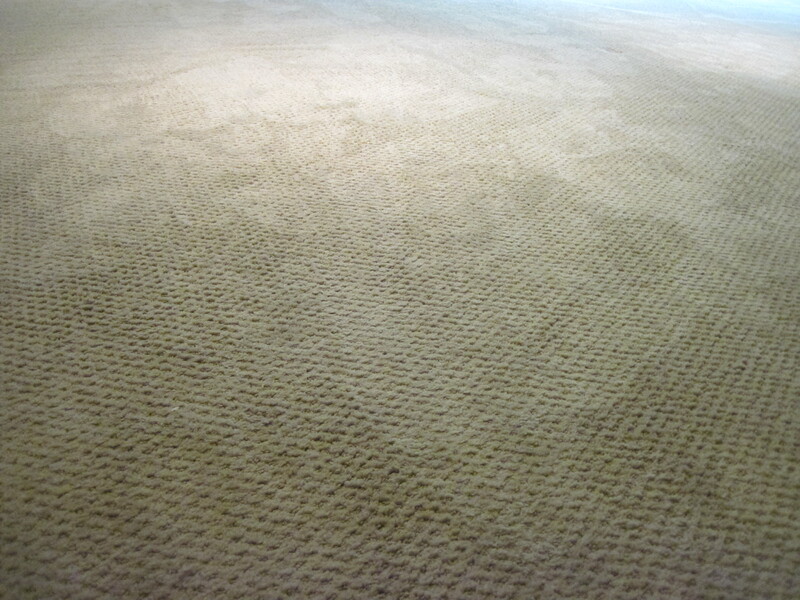 We didn’t sand it a lot, just smoothed it out a little. We stood our frame upright for this step. 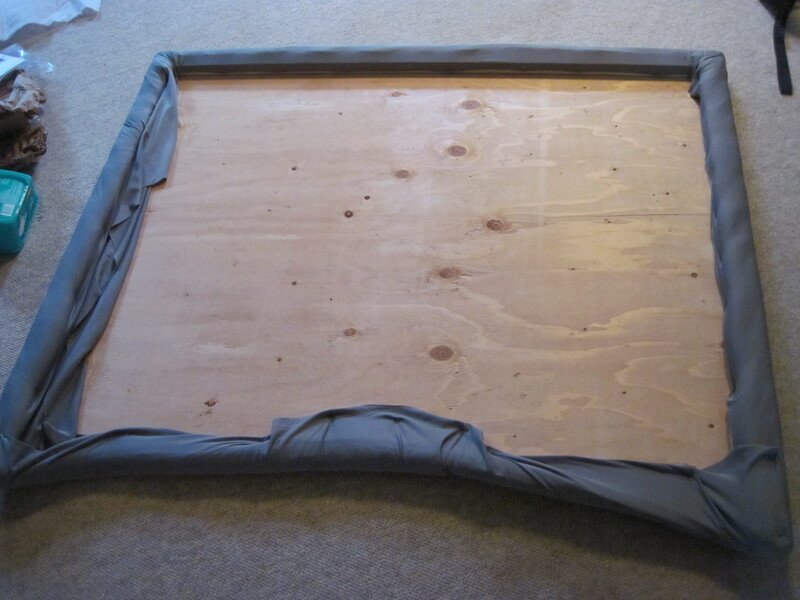 We draped the fabric across the frame and stapled the batting to the back of the frame. We used 4 layers of batting and 1 layer of fabric. …but we pulled the fabric to the sides of the 2x3s to give the back a slightly more finished look (even though no one will probably see it). 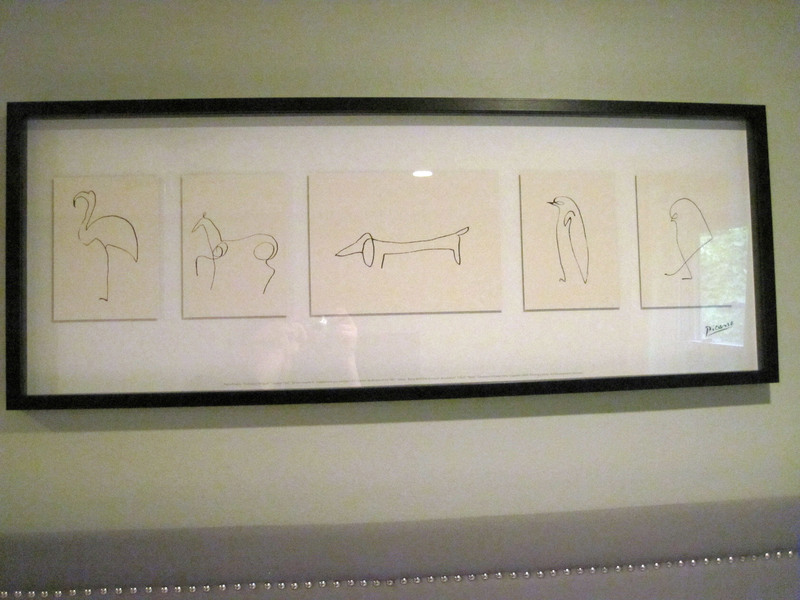 We thought this might prevent it from looking funny against the wall when you see the headboard from the side. As a side note, we did not wash the fabric before we used it. Maybe we should have, but we didn’t. If you’re doing what we did (individual nailheads instead of a nailhead trim kit), this step takes forever because you have to individually hammer each nailhead into the headboard. To make a straight line, we tied a piece of string around the headboard and measured both ends to make sure it was 2 inches from the side the whole way. It gave us a great straight line, but was easy to move by accident (i.e. we had to keep checking to make sure it was still straight). A lot of the nailheads broke as we worked through the project. We discovered that the most efficient way to manage the nailheads was to hold them with needlenosed plyers and hit them with the rubber mallet. If they weren’t perfectly located, we were able to move them a decent amount by putting a screwdriver on the side of the nailhead and hitting the screwdriver with the mallet. This did not scratch our nailheads, but we might have just gotten lucky. Step 9: Step back and admire your hard work! 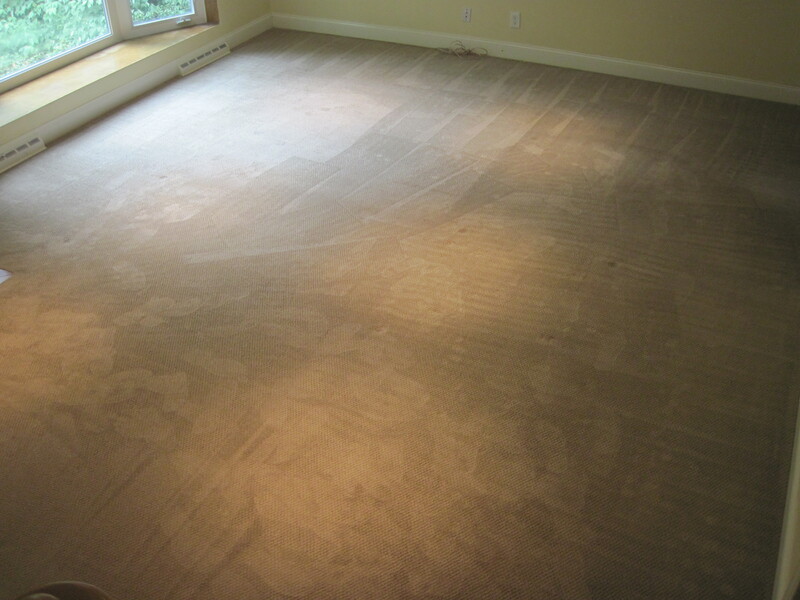 Our favorite part was the fact that we were able to get this project done in about 2 days. Super easy. We also didn’t try to get through all the nailheads in one day, but we probably could have if we tried. Total savings: $454.28 (+ $60 delivery surcharge savings) Woohoo! This project is a total “bang for your buck” project. We were really happy with the savings (obviously), but we also feel good about making it ourselves. And we sleep way better because it makes our room feel so much cozier. Have any of you tried to DIY a headboard? Bought a new headboard? 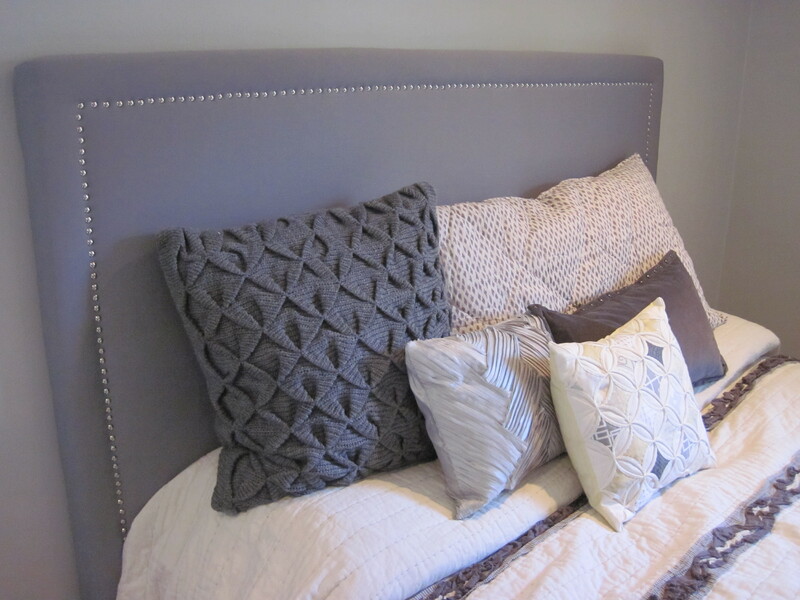 Have a nailhead headboard that you love? Day 10 of the Get Out of Our House! Challenge. It’s a big day; we’re 1/3 of the way finished with the challenge. 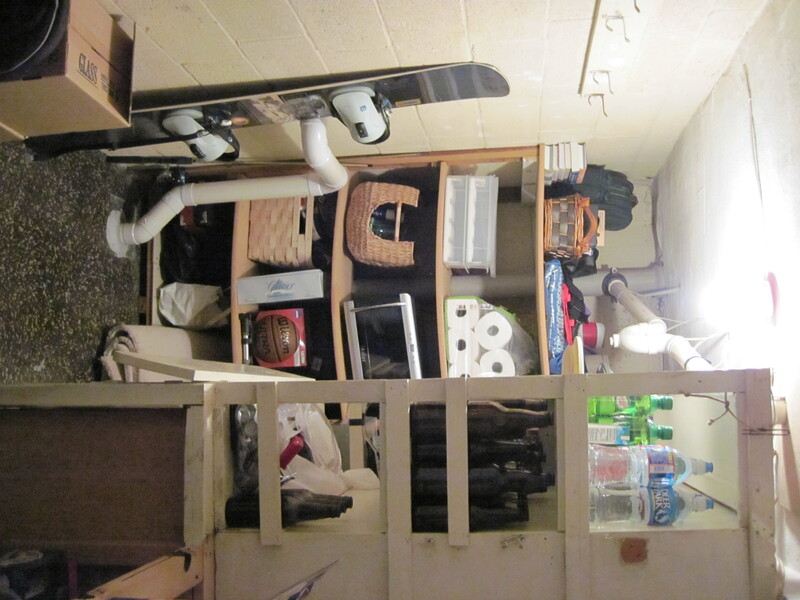 To commemorate the occassion, we went for a big clean up… The Laundry Room. 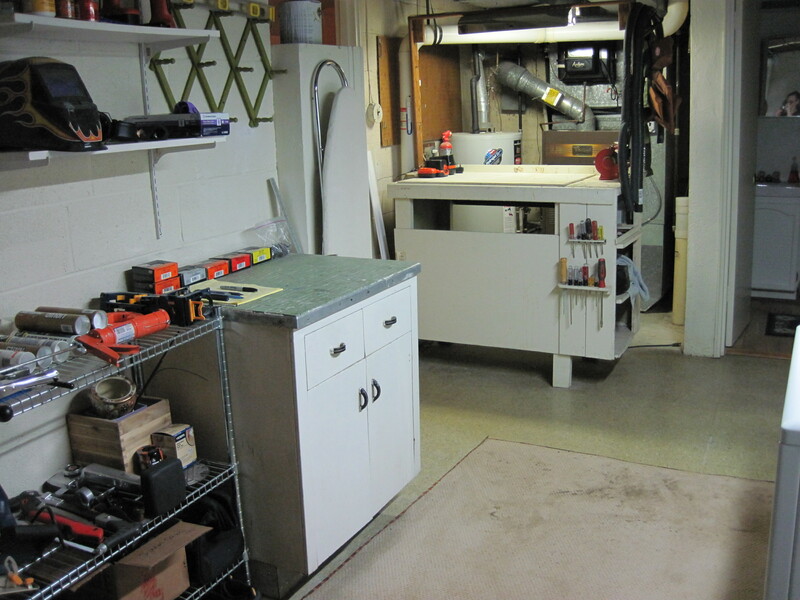 We know, the laundry room seems like it shouldn’t be the store-everything space, but for us it is. 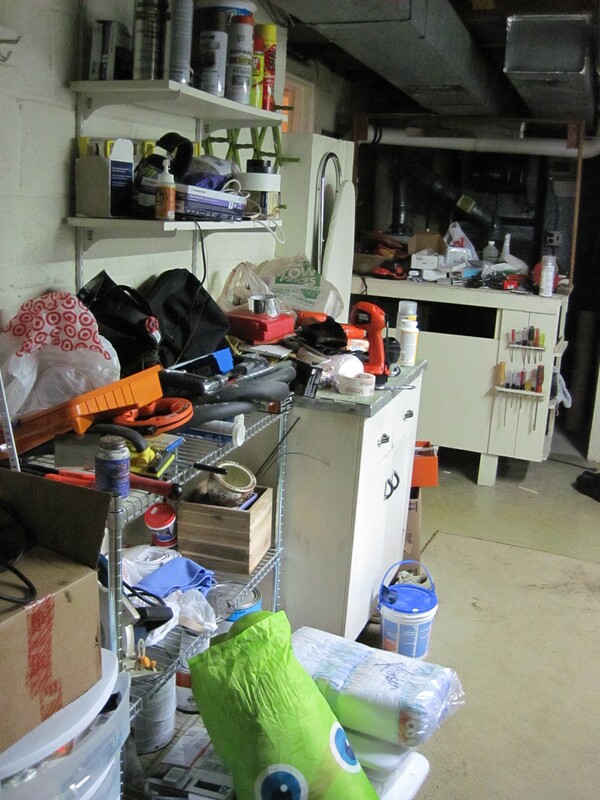 We have all of our tools, automotive supplies, laundry, and some general housekeeping stuff in there. Or we did…. We love how many of these clean-ups are turning into money in our pocket. We totally forgot we had bags of stuff to return, so they would’ve probably sat there forever if we hadn’t cleaned up. Now, not only do we feel excited about how clean things are when we walk into the laundry room, but we also feel good when we see those returns on the credit card! 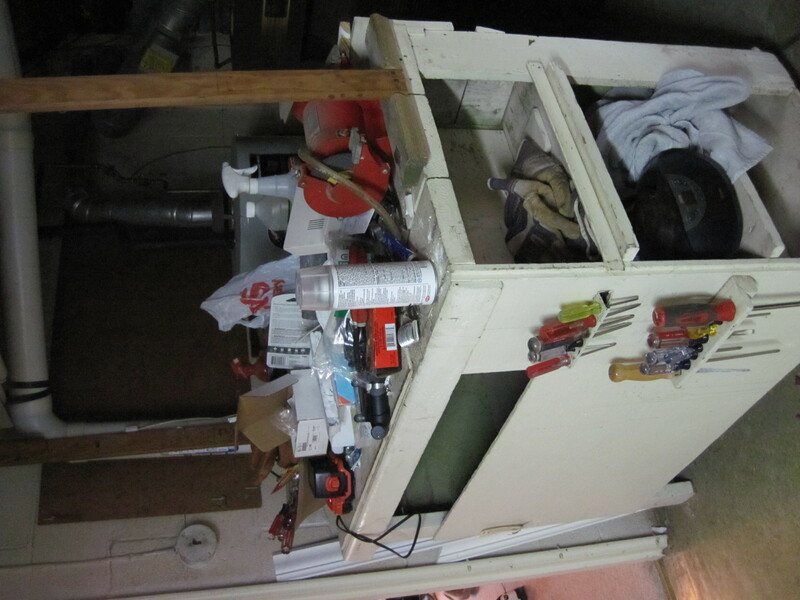 Oh, see all of that equipment behind the workbench? 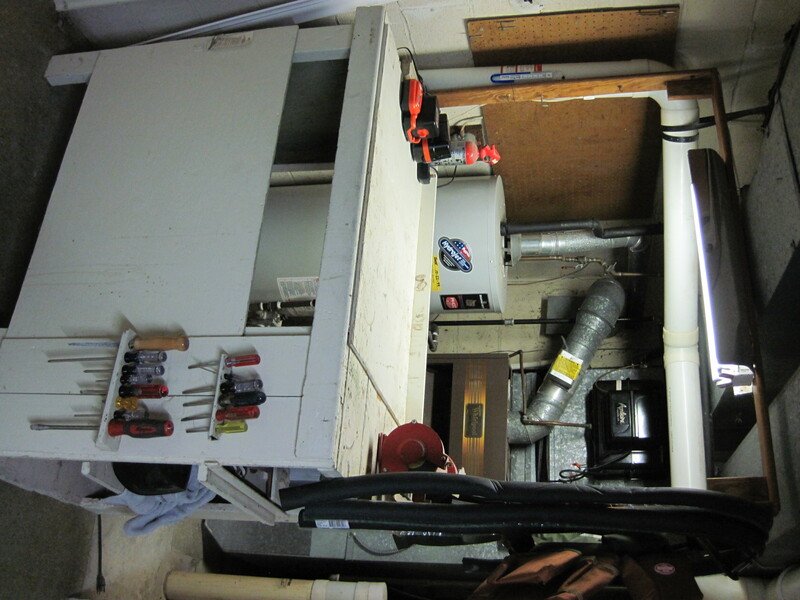 Someday when we update the laundry room, we are hoping to close that equipment off (but still keep it accessible in case we need to replace anything). 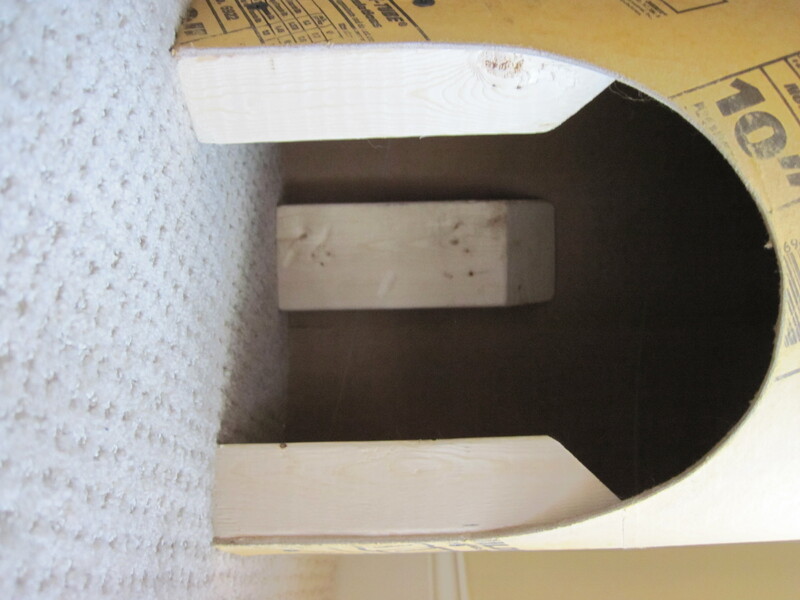 For now, it’s just going to have to be a rustic look…. Gigi likes it better this way because she can hunt dead bugs back there. That’s right: hunt dead bugs. It happens. Get Out of Our Coat Closet! A couple of weeks ago, we asked you (and reminded you) to declutter your house in 30 days. Join us in the “Get Out of Our House!” challenge: clean up and clear out 30 spaces of the house in 30 days. We are going to literally go through 30 parts of our house – closets, drawers, rooms, etc. 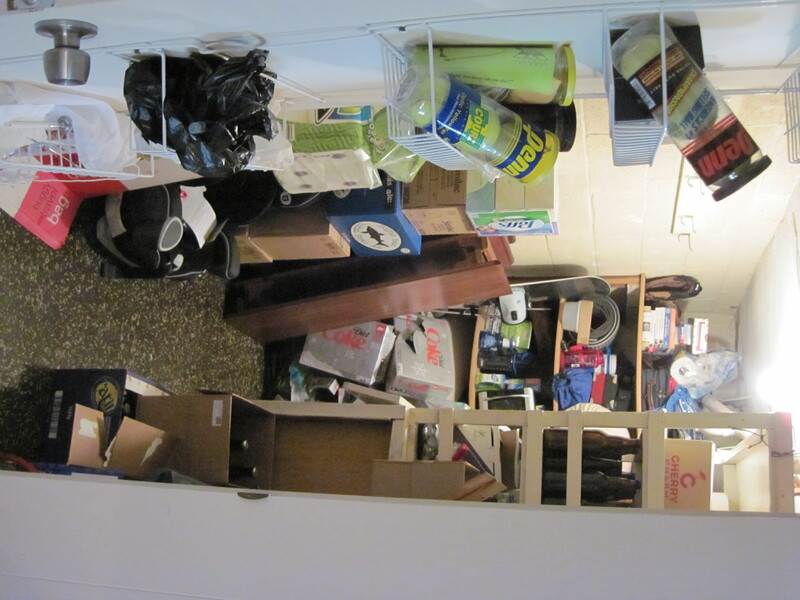 – and see what we can donate, trash, repurpose, and/or reorganize. 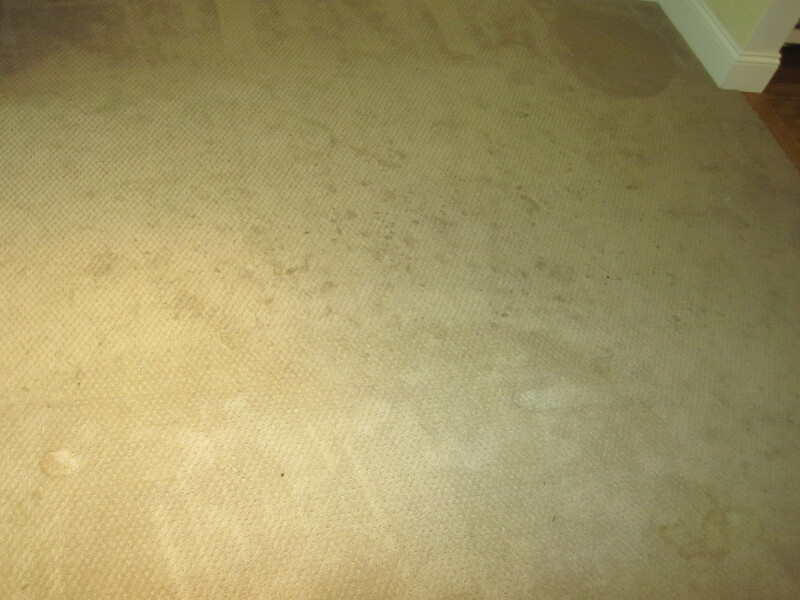 No space is too small (or too big) to clean up. 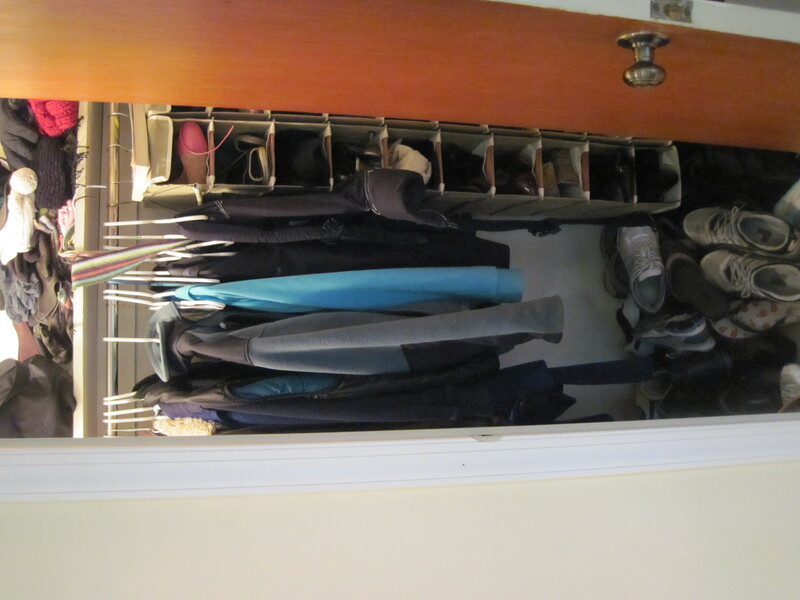 We started off the challenge in full force: the entry way coat closet. While we were in there, we invested in a few matching woven baskets to keep the winter hats, scarves, and gloves organized. One for each member of the family. Our favorite part is that we can now find our shoes, which used to be piled up on the floor. How did you kick off the challenge? Our baby is one year old TODAY! We threw a party. It was awesome … a low key, intimate affair. Sure, we know that this post sounds a bit like it belongs on our family blog, but we thought we’d show you how we decorated our living room for the big party. You could say it was a Pinterest-inspired party, because all of the decorations, were, well, inspired by pictures we found on Pinterest. When you first walk up to the house, you see a wreath made of deflated balloons (inspiration). After you open the door, you see a huge number “1” made of Kasen’s pictures from the year (inspiration). We’re hoping to continue this as a tradition through the years. We put his monthly pictures in sequence on the wall. He’s grown so much! We turned his pack-n-play into a ball pit. All of the kids enjoyed banging the balls together and throwing them out of the pit. (he hasn’t learned how to say “mine!” yet, phew). To keep the kids busy, we had bubbles out (inspiration) and gave everyone goodie bags with toys inside! The goodie bags were simple white bags from Michael’s with scrapbooking stickers and curling ribbon tied on top. Kasen wasn’t a huge fan of the cake (“what is this stuff stuck to my hands!?!”). We decorated his chair with a fabric square from Joann (safety pinned to the fabric of his high chair) and tied some curling ribbon to the safety pins. We also tied ribbon to the bottom of his high chair and on string around the pack-n-play (inspiration). We expected the kids to pull on it and poke at it, but they focused on pulling and poking Gigi instead (she’s such a tolerant puppy!). And Kasen’s favorite part of the day wasn’t in party-central; it was in his bedroom! We surprised him with balloons covering the floor. He was surprised when he woke up and every time he went into his room, he wanted to play with the balloons on the floor. (inspiration) We hope to keep this one up over the years too.